Consistency is one of the best ways to earn trust. So in your content strategy, a “toe in the water” approach isn’t going to cut it. You simply have to commit to being consistent. That means that you’re going to have to love the process – not just the results. Are you up for that? If your business depends on having an audience, you have to stand back a little and let it evolve naturally. 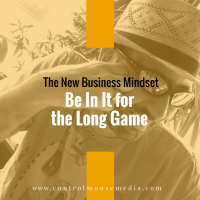 You have fight your own impatience, get comfortable with not having control, learn to relish the indirect benefits, and ultimately, play the long game. Rather than looking solely at traditional business metrics, what if we made decisions based on earning trust instead? Episode 95 is about the limitations of ROI in trying to measure your content marketing efforts, and how to focus instead on getting to the Threshold of Trust. Generosity works. When you serve, you earn the right to serve again. Over time, you earn enough trust to ask for the sale. This used to be hard to scale, but not anymore. It starts with a genuine desire to help, and as I’ve learned – what you get in return might surprise you. Movies often portray success in business as a cut-throat, relentless climb to the top. Someone has to lose in order for you to win. That’s just not the case anymore, if it was ever true at all. Here’s what the principles of content marketing taught me about today’s business world. Introducing a new 16-part series about counterintuitive business lessons that I’ve learned from my mentors and the mistakes I’ve made. 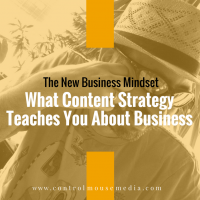 It turns out that the same nuances that work in running a good content strategy also work in running a business as well.